That natural stone (a natural marble, travertine, a granite) served long, and a leaving(care) of it(him) was minimal, insufficiently correctly to choose a material according to conditions of operation. It is necessary to lay it(him) correctly still. First of all it concerns bathrooms, pools and other premises(rooms), where natural stone (a natural marble, travertine, a granite) contacts to water. Here it is necessary to use only waterless glutinous structures on a polymeric basis which simultaneously serve also as an additional waterproofing. Generally water penetrating inside of stone facing through Spaces and Between plates seams, easily evaporates (if, certainly, temperature in a premise(room) does not fall below zero). However if natural natural stone (a natural marble, travertine, a granite) is stacked on a water solution water will begin to wash away a glutinous basis. In result on a surface will appear characteristic whitish , will get rid from which rather difficultly. If at stacking waterless polymeric glue was used, it will not take place. And one more important point connected to water water. Strongly recommend to put filters clearing and softening water, " then problems with limy adjournment on a natural stone begins much less and will demand only usual actions for maintenance in cleanliness. 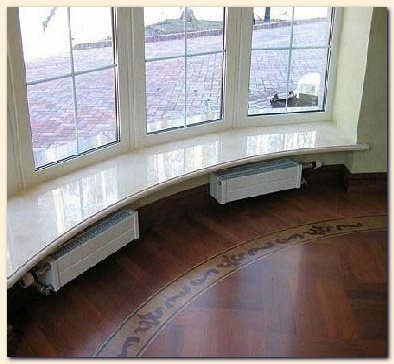 something similar occurs to a marble and in private(individual) apartments, in especially slushy winter. And degree Dangers directly depends on quantity(amount) of visitors of your house. To remove(take off) an acuteness(a witticism) of a problem, a floor in hall it is better to make of polished granite of dark tones then dirty on it(him) will be practically imperceptible. But mean: told concerns only to an internal entrance zone. At all do not apply polished granite for external Edge(territory) of a ladder as snow, rain and other deposits do(make) polished natural stone (a natural marble, travertine, a granite) very slippery and Dangers! In this case it is more logical to use not polished granite with Fiery processing of a surface. Take care also of that input(entrance) in house was equipped . They will leave on themselves most part of sand and a dirty, that essentially will simplify a leaving(care) of stone facing. it is not recommended to apply polished natural marble to manufacturing kitchen table-tops. slice of a lemon forgotten on such table-top simply Will spoil polishing, and To pour coffee, juice or oil will leave on a surface of a stain, will get rid from which rather difficultly, and sometimes and it is impossible. Certainly, modern means on a leaving(care) of a stone are capable to protect a natural marble from these and other troubles. Having processed a table-top special structures, it is possible to put a reliable barrier to water, oil, acids etc. But it is necessary to mean, that procedure of drawing of expensive protective preparations should repeat regularly. Besides constantly it is necessary to watch(keep up), that on a marble covering have not got Forbidden products. from very beginning it is much easier to establish on kitchen a table-top from a natural granite and then leaving(care) of it(her) will be reduced to a minimum. As today in market stones practically any color and structure are submitted. However, even behind granite surfaces (it is especial from a light porous stone) minimal leaving(care) is all same necessary. As to a bathing room, here, on contrary, it is more preferable than marble. It speaks that polished granite - rather slippery covering. And in a bath where water on a floor - not a rarity, it may be simply dangerous. Therefore here frequently it is necessary to cover a granite structures with effect Against sliding, that is besides connected to additional expenses of money and time. A marble by virtue of greater porosity - not such slippery material so, any especial leaving(care) of it(him) in this sense it is not required. 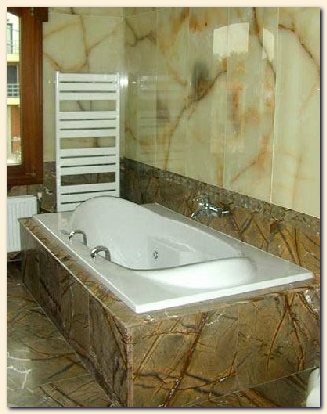 However in polished marble for a floor in a bathing room all same to take a great interest does not cost. As a natural stone (a natural marble, travertine, granite) in a bath constantly is in contact to water installation of filter for water treating will relieve you of necessity regularly to delete a limy strike. At a choice of facing for a floor special attention needs to be given invoice of a natural stone. She(it) happens polished or not polished, and regularity of a leaving(care) of a covering and expenses accordingly connected to it depends on it(her) too in many respects. On not polished ( or ) surfaces of deteriorations it is swept less up, than on polished. Therefore maintenance(contents) floors more economically. On not polished stone, for example, there is no problem Tracks of ants (so name Path, worn in places with greatest stream of people). Polished coverings are more pertinent as facing vertical surfaces and there where they will not be used up strongly. If polished material is used for furnish of a floor in zones with intensive enough movement it is necessary to be ready to that procedure professional Polishing (restorations) becomes a usual part of a regular leaving(care). All told concerns first of all to a marble as it(he) is more vulnerable, than a granite. Get(start) a habit immediately to delete from marble facing all liquids " juices, alcohol, coffee, any acids. Wash out this place pure(clean) water and dry a paper towel. *nbsp; If stain all same has appeared, before to use cleaners of dot action (both alkaline, and acid), all over again test them on a small site of a surface. Begin with low concentration of a cleaner, increasing her(it) only after be convinced, that she(it) does not operate. Do not hurry up, give a preparation to work 10-15 minutes. *nbsp; Before use of means on a leaving(care) of a natural stone always closely(attentively) read instruction and summary of firm - manufacturer. Each word in instruction has big value! *nbsp; Besides studying instruction in detail ask on features of application of a preparation authorized firm personnel of seller. Experts will prompt optimum decision, proceeding from experience of professional use of given means. Any of building materials, except for a natural stone (a natural marble, travertine, granite), may not apply for a rank Eternal. Not for nothing natural natural stone (a natural marble, travertine, granite) is considered a symbol of durability and durability. Eventually it(he) only gets special charm of antiquity. Besides natural stone (a natural marble, travertine, a granite) is indefinitely various, and this property only natural materials. Even most perfect imitations are not capable to replace it(him) to full. Each product from him(it) - is unique. - Wear resistance. High resistibility of a natural stone (a natural marble, travertine, a granite) to Deterioration successfully allows to apply it(him) in floor coverings. It is enough to recollect floors in hall stations of Moscow underground, many of which were handed over in operation in 30th years. Porosity of a natural stone (a natural marble, travertine, a granite) provides comfortable conditions of a presence(finding) in a premise(room). 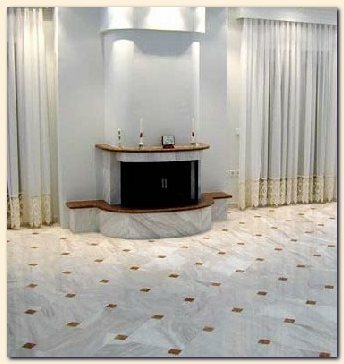 - natural natural stone (a natural marble, travertine, a granite) is universal in application. It(he) is good as for external facing, so for internal furnish of premises(rooms). - does not render negative action on an organism of person. - natural stone is perfectly combined with various kinds of furnish, that considerably expands sphere of his(its) application. - For a long time natural stone (a natural marble, travertine, a granite) does not change color and a structure. - To riches of color and a structure of this material have paid attention in an extreme antiquity. - Profitability - at competent use, stone facing due to durability provides reduction of charges on operation of buildings in 5-8 times in comparison with furnish from other materials. Is an ideal material for manufacturing floors, ladders, Windowsills, facings of pools and baths. Art of drawing up of a stone mosaic began with plain patterns from a color pebble with which ancient Greeks decorated internal court yard of houses. Later at registration of interiors of palaces and temples began to use a granite, a marble, semiprecious and even jewels. first spread floors, from second created surprising on beauty of a panel. Due to such properties of a stone as durability, stability to destruction and ageing, we and today may admire fragments of amazing mosaic floors in antique monuments of architecture kept in territory . For example, in temple (V in. Up to . .) images of sea deities in a frame of ornaments are combined from fine (about 1 sm in a diameter) cut slices of stones of different color. So one of basic drawing up of mosaic figures - type-setting has appeared. In same engineering masters of Ancient Rome worked also, putting(folding) mosaic images from cubes or columns of approximately identical size and form. received surface or ground, or if she(it) was on sufficient removal(distance) from spectator, left rough. Seams between cubes might differ on thickness that gave to image effect of volume. Ancient Egyptians too were familiar with art of a stone mosaic, but used her(it) more . From semiprecious natural stones they typed(collected) plaquettes with which then decorated furniture, subjects of a life and even full dresses of pharaons. This engineering close to incrustation became a prototype of other popular kind of a mosaic - , or piece. In this engineering a mosaic make of thin plates of ground marble or a jasper, cut out on contours of image and so densely adjusted to each other, that seams between them practically is not visible. This art has reached(achieved) perfection in XVI century in Florence that is why has received name of Florentine mosaic. By way, in engineering of Florentine mosaic well-known Amber room on which manufacturing it is cunning in due time from above Floor of one million slices of amber was executed. Already more than 20 years in workshops Ekaterininskogo of a palace in Tsarskoe Selo recreate lost masterpiece on photos, hoping to finish grandiose work to a 300-anniversary of St. Petersburg. Small amber a plate grind and paste on wooden panels by means of mastic welded(cooked) under ancient recipes. By way, from one kg of amber in business goes only 150 grammes. About art of Russian stone mosaic have started talking in XVIII century when on Ural extraction of a natural stone was begun. Creatively developing engineering of Florentine mosaic and masterly using richest palette of Ural semi-precious stones, Russian masters achieved tremendous results. Pieces of a dense stone, mainly malachite, sawed on plates thickness of all some millimeters and adjusted to each other so that natural figure of a stone has merged in a single whole. Then plates pasted on form from a stone or metal, all roughnesses carefully ground, and a surface polished. In result seams between became practically invisible and full illusion of a monolith was created. In this engineering were carried out not only well-known malachite vase, floor lamps, table-tops, but also facing of architectural details anyone, even most complex(difficult) form. In engineering of Russian mosaic huge columns in and a cathedral are executed, for example. However it is not necessary to think, that stone mosaic approaches only for an ornament of palaces and cathedrals. Her(it) with success apply and in registration of private(individual) houses. 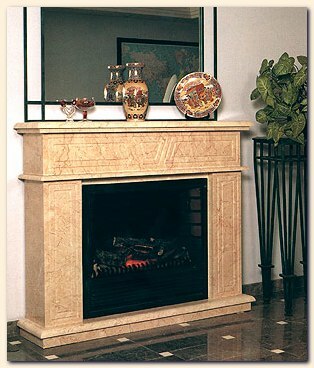 For example, graceful mosaic insert near a fireplace or in centre of a drawing room will change any interior. This surprising material with success is capable to replace a list on walls: you see mosaic not only is beautiful, but also practically eternal&. 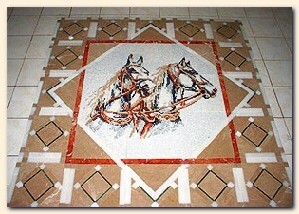 In most prestigious houses it is possible to see table-tops, bar racks and other surfaces trimmed with a mosaic. stone mosaic in bathrooms and covered pools which today are very fashionable for making out in antique style is perfectly looked. mosaic may make unique not only internal, but also external shape of a house if to decorate with her(it) socles, facades, a front entrance of a building. Very much frequently a stone mosaic use at arrangement of space around of a house: her(it) spread pathes and platforms, make out fountains and internal court yard. Thus, mosaic becomes a basis of fine landscape compositions. 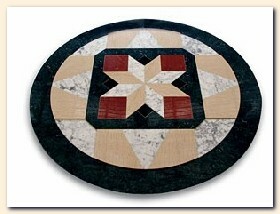 At creation of mosaics use most different breeds of a natural stone - from , travertine and marble up to onyx, jaspers, lazurite... An infinite variety of colors and shades of a natural stone allows to create unique mosaic panels. And you see master may use not only riches of colors, but also various invoices and engineering of processing. 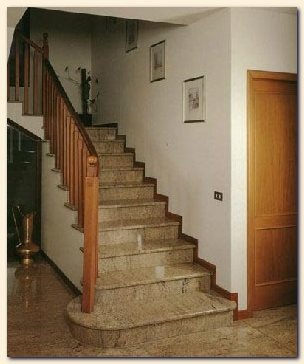 For example, (a natural marble, travertine, a granite) it is possible to grind, polish a natural stone, it is artificial . there Are two basic ways of stacking of a mosaic - direct and return. At direct set known still(even) from antiquity, image fix directly on surfaces. Presently this toilful engineering use seldom only at creation of especially complex(difficult) images or most important fragments of a panel. At return set including in practice in XVIII century, slices of a mosaic a face sheet stack on a contour of figure on a tracing-paper (a fabric, a cardboard, a paper), with help of gluing structure fix from back party(side) and put on a surface as a complete composition or a large fragment. Engineering of a return set has opened ample opportunities for industrial production of a mosaic. Now her(it) let out as ready modules - squares or rectangulars in size 300 300 or 300 600 mm, and as a basis usually use a flexible grid. 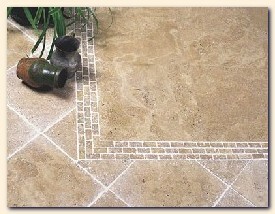 Manufacturers offer even ready sets reminding of which it is independently possible to make a mosaic panel. Only it is necessary to remember, that modules to ideally leveled surface special glues, and between modules paint over seams special .